Daytime: the photovoltaïc module captures the solar irradiation and converts it into electricity. This energy is stored in the Power 365 battery. 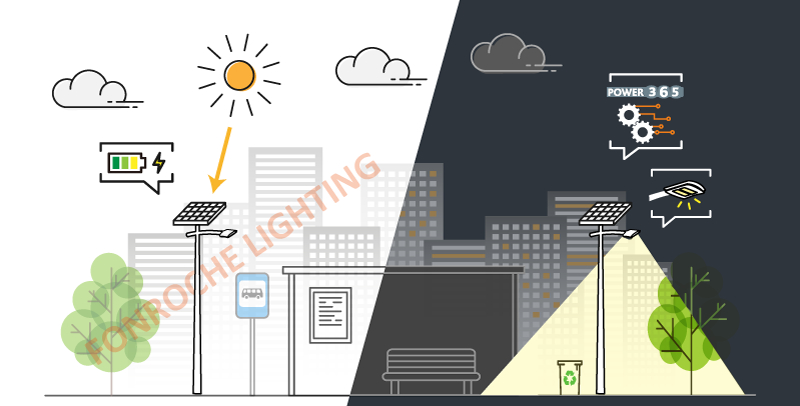 Night-time: the battery releases its energy to power the LED fixture according to the required lighting profile. Our anti-blackout technology ensures permanent lighting throughout the whole night. Fonroche’s R&D team developed our state-of-the-art solar street-lighting technology by designing every component we use in our systems from scratch. The photovoltaic module and the nickel-alloy battery are entirely designed and manufactured in our ISO certified factory in Roquefort, south-west France. High-efficiency crystalline cells for optimal light capture in all weather conditions. High-performance, energy-efficient LED light unit: 20 to 120 watts nominal. Specially designed by Fonroche for our solar lighting solutions. - Safety and security: anti-blackout system, no outages possible.